Firemoth (also known as Firemoth Island or Firemoth Region) is a region encompassing a ring of barren islands located in the Inner Sea. The islands often suffer heavy storms, and the bare volcanic rock provides little nourishment for flora. Hardy trama shrubs and stark, leafless trees can survive the ashen, bitter soil, and marshmerrow reeds flourish along the sandy beaches, but otherwise the islands are devoid of life. In the mid-Second Era, the region's climate was milder and Firemoth was much more lush with vegetation, resembling the nearby swamps of the Bitter Coast. 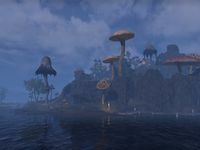 It was home to a large array of flora and fauna, including Emperor Parasols, mudcrabs, shroom beetles, and even alits. At some point, House Redoran maintained a fortification on the island known as Fort Firemoth. 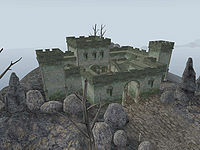 However, the Redoran allowed the fort to go fallow, and House Hlaalu exploited this abandonment to begin encroaching upon ancestral Redoran territory on Vvardenfell. In time, the Hlaalu were successful in driving the Redoran out of major regional settlements such as Balmora and Suran. Circa 2E 582, a band of slavers established themselves on the island, making use of the Redoran compound and docks. They worked in collaboration with Governor Omellian of Seyda Neen to use the Grand Pharos lighthouse in Seyda Neen to capsize passing ships and sell the captives into slavery, which was illegal in Ebonheart Pact territory. This plot was ended when Deputy Governor Deminah Salvi learned of Omellian's treachery and sent soldiers to clear out the slavers and liberate their captives. Simultaneously, an agent of the Morag Tong named Naryu Virian arrived at Firemoth with a writ to assassinate the leader of the slavers, Captain Svadstar. She broke into the compound and helped the captives overrun the island, before boarding Svadstar's ship and assassinating him while he was engaged with the forces from Seyda Neen. By the Third Era, the archipelago had turned barren. The Imperial Legion built a new Fort Firemoth made of stone, housed on the main island. Once a strategic strong point guarding the Inner Sea from smugglers, it was overrun when an undead army led by the lich Grurn marched out of the ocean and captured the garrison, leaving few survivors. While still technically Imperial territory, the islands remained occupied by the skeleton army and were never reclaimed. The fort was built on top of a rich ebony mine, which broke through into flooded natural caverns and an ancient Velothi tomb. In 3E 427 a band of adventurers hired by the Imperial Legion set sail for Firemoth from Seyda Neen, infiltrated the ruins of Fort Firemoth, slew Grurn, and retrieved the Ward of Akavir, a precious enchanted shield. This page was last modified on 21 October 2018, at 07:48.